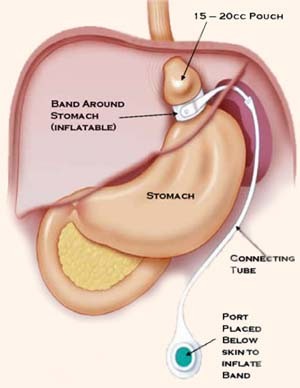 The Realize Adjustable Gastric Band obtained FDA approval in 2007. Realize Band-C has a 14% greater adjustment range than the Realize Band. Both the Realize Band and Realize Band-C, however, are one-size-fits-all. The device differentiates itself from the Lap-Band AP series through its sutureless injection port installation and larger range of isostatic adjustments. The maximum fill volume for the Realize Band is 9mL, while the newer Realize Band-C has a fill volume of 11mL. Both fill volumes fall within a low pressure range to prevent discomfort or strain to the band. 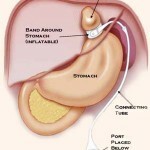 Two other adjustable gastric bands are in use outside of the United States: Heliogast and Midband. Neither band has been approved by the FDA. The Midband was the first to market in 2000. In order to preserve the gastric wall in event of rubbing, the device contains no sharp edges or irregularities. It is also opaque to x-rays, making it easy to locate and adjust. The Heliogast band entered the market in 2003. The device features a streamlined band to ease insertion during the operation. If considering pregnancy, ideally the patient should be in optimum nutritional condition prior to, or immediately following conception; deflation of the band may be required prior to a planned conception. Deflation should also be considered should the patient experience morning sickness. The band may remain deflated during pregnancy and once breast feeding is completed, or if bottle feeding, the band may be gradually re-inflated to aid postpartum weight loss as needed. Typically, patients who undergo adjustable gastric banding procedures lose less weight over the first 3.5 years than those who have RNY gastric bypass, BPD, or DS surgeries. Although other procedures appear to result in greater weight loss than adjustable gastric banding in the short term, results from the study by Maggard suggest that this difference decreases significantly over time. 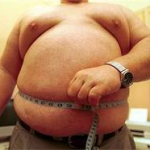 Gastric banding patients lose an average of 47.5% of their excess weight, according to a meta analysis by Buchwald.